Colombo, Sri Lanka | AFP | Sunday 7/2/2017 – Sri Lanka deployed hundreds of soldiers to destroy mosquito breeding grounds as the country battles the spread of deadly dengue fever that has killed a record 215 people this year, officials said Sunday. Humid monsoon weather, stagnant water from recent flooding, as well as mounting piles of rotting garbage accumulating in the capital, have combined to create abundant areas for mosquitoes to multiply. This has caused rates of dengue, a tropical disease that is spread by mosquitoes, to surge to over 71,000 people infected in the first six months of this year, a record figure that far surpasses last year’s total of 55,000. Troops, backed by police and health officials, have launched an intensive campaign to identify dengue hotspots to be sprayed with insecticides, the military said in a statement. 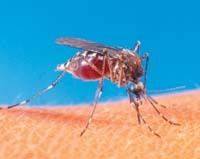 “Twenty-five teams will separately move into the worst-affected areas in and around Colombo, and search for dengue breeding spots and other vulnerable areas,” the statement said. The scale of the spread of the disease has been unprecedented and caught Sri Lankan authorities off guard. Health ministry officials said the 215 deaths in the first six months of this year compared with 78 reported during the whole of 2016. Authorities have blamed a garbage disposal crisis in Colombo for the spread of dengue. The country’s main rubbish tip collapsed in April, crushing dozens of homes and killing 32 people. With nowhere to take the trash, municipal collection has drastically slowed and led to huge piles on the streets, which authorities say help mosquito-breeding. Stagnant water left behind after last month’s flooding was also seen as contributing to the spread of dengue.